On Saturday 3rd December, lightning started two fires 20km south of Cocklebiddy - between Eyre Bird Observatory and the Eyre Highway. A frequent flow of information between the WA Department of Parks and Wildlife and the observatory (and management committee), made the best of a tough situation, the importance of the work that has been done in developing a fire mitigation plan, in maintaining fire breaks, regularly testing fire fighting equipment etc. cannot be overemphasised. The observatory caretakers, Philip and Judy, were evacuated on two occasions to Cocklebiddy, and allowed to return as conditions changed. 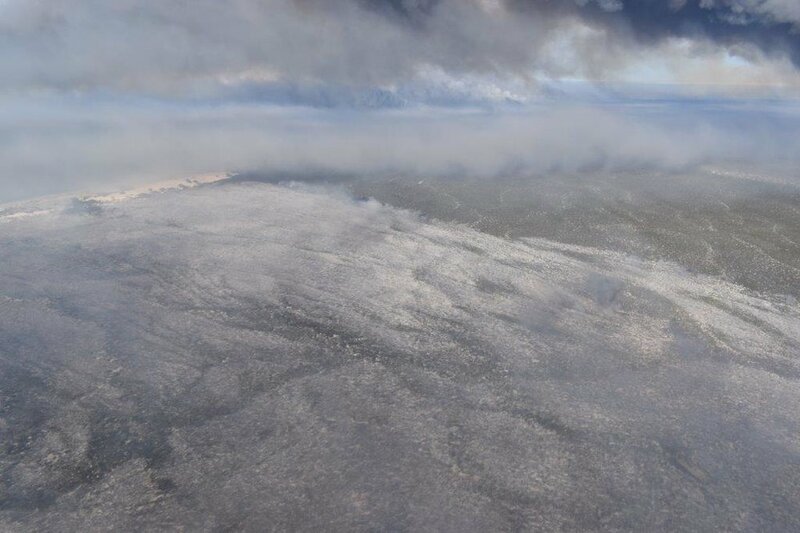 As it happened, a change in the weather halted the fire - over 36.2mm brought a stop to the fire which burnt over 55 000 hectares, it came within a scary 2 kilometres of the observatory building. It has been an estimated 120 years since the last bushfire at Eyre, so it may well be that we were overdue for one. The observatory will remain closed for the rest of the year, and will remain so until the nature reserve is declared open. As a functioning research station, the observatory is keen to get some post-fire research off the ground.